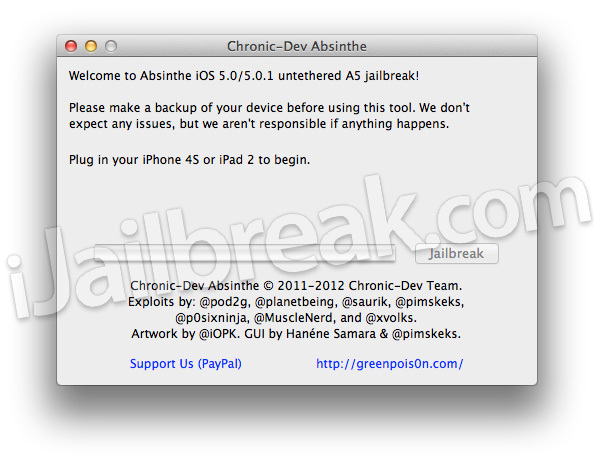 The Dream Team, consisting of numerous hackers from the Jailbreaking community, have released the iPhone 4S Untethered iOS 5.0 and iOS 5.0.1 Untethered Jailbreak in the form of a new Jailbreaking tool, dubbed Absinthe. The Absinthe Jailbreaking tool can Jailbreak the iPhone 4S running the iOS 5.0 firmware and both versions of the iOS 5.0.1 firmwares (9A405 and 9A406). Thus, In this how to guide from iJailbreak.com you will learn how to Jailbreak your iPhone 4S running the iOS 5.0 and both versions of the iOS 5.0.1 firmwares with Absinthe for Mac OS X. Perquisites: The very first thing you need to do before starting this how to guide is make sure your iPhone 4S is backed up. As the Absinthe Jailbreaking tool was just released, there is a good chance that you may experience an error Jailbreaking it. Thus, it is always a good idea to make sure all your content on your iPhone 4S is backed up. Additionally, if you iPhone 4S has a passcode lock you must disable it, and furthermore you will need to disable any current VPN’s setup on your iPhone 4S. Recommendation: It is our personal recommendation that you simply restore your iPhone 4S to factory settings on the iOS 5.0.1 firmware (if you do not require an unlock). This will dramatically reduce the chance you have of experiencing an error while Jailbreaking it. Step 1) – The first thing you will need to do is download the latest version of the Absinthe Jailbreaking tool from the iJailbreak Downloads Section or from one of the direct download links below. It is always recommend that you check the iJailbreak Download Section, however, to ensure that you are downloading the latest version (we do not always update these guides with the up-to-date versions). Step 2) – Launch the Absinthe Jailbreaking tool, from the directory you downloaded it to, by clicking the Absinthe app shortcut. Step 4) – Once your iPhone 4S reboots you can slide-to-unlock it and then on your SpringBoard (homescreen) you should notice a new Absinthe icon. Tap this Absinthe icon now, the official GreenPois0n website should appear for an instant, and then your iPhone 4S will reboot. Upon being rebooted you should notice that Cydia takes the place of the prior Absinthe icon. Congratulations! You have just Jailbroken your iPhone 4S Untethered running the iOS 5.0 or iOS 5.0.1 firmware with Absinthe. The Absinthe Jailbreaking tool is extremely new, and thus there is going to be numerous errors people encounter. iJailbreak.com has done its best to reference the most common errors people are experiencing and additionally provide solutions for them. Tip #1: If you are experiencing “Error establishing connection” this is simply because the servers hosting this Userland Jailbreak is being overloaded with traffic. Your best bet is going to be to keep trying to launch the Absinthe app on your SpringBoard, or simply wait an hour or two and try again. Another solution that has been reported to work for this error is to simply go into the Settings.app > General Tab > Network Tab > VPN Tab and then toggle VPN to the ON position. This will cause an error dialog box to appear where once dismissed will reboot your iPhone 4S, and in most cases will allow you to use the Absinthe app to finish your Jailbreak. Tip #2: If you are having troubles getting the Absinthe app to appear on your iPhone 4S’ SpringBoard, or are just having errors in general with Absinthe you can follow Planetbeing’s advice to — Run Absinthe from Terminal by using the cd command to navigate to the directory where Absinthe is located (on your computer) and then type the following ./Absinthe.app/Contents/MacOS/Absinthe (now simply start the Jailbreaking process over again). Tip #3: If all else fails, try restoring your iPhone 4S (if you have not already) to factory settings, restart your computer and switch USB ports. is the absinthe closing unexpectedly on mac os for anyone?? After recovery, run the jailbreak again. For best results, back up and restore. Then jailbreak. Then restore from back up. It goes way faster. I have successfully jailbroken my iphone 4s but i installed the “activator” thing from cydia then my cydia app dissapeared is there a fix for this? been sitting all day in front of my computer waiting for the windows version!!!! when is it available!!!! Same for me, I get Beginning jailbreak, this may take a while… for almost an hour, then it crashes unexpectantly. ERROR: mb2_handle_receive_files: too long device filename (16777216)! Device is not ready yet. Going to try again in 2 seconds…Entity: line 1: parser error : Start tag expected, ‘<' not found N ~ 6G . Y < ~f G Z U a T5 UE ( C C 1 M I; fq ^Device is not ready yet. Going to try again in 2 seconds…Entity: line 2: parser error : Start tag expected, '<' not found z j2 T ,"* nH @( T ^Help! I had the same thing on my iPad2.. Was taking forever. I did a fresh restore in iTunes, then ran the jailbreak again, and the whole thing took about 5 minutes. Then I restored from my back up in iTunes. Working great now. oh I see.. I restored in itunes and then restored from my back up again.. and retried jailbreaking… ok ill restore and jb before attempting to restore from backup in itunes and ill post results. Trying this method. I was hoping somebody would reassure me that I can, in fact, restore from an iCloud backup once I’ve jailbroken. I’ll post here once I’ve finished. Thanks Mike and 33p3. I can confirm that restoring as a new ipad under factory settings will allow Absinth to work as expected. It took me four hours of trying before your comments solved my problem in about three minutes. Thanks! The jailbreak froze and when I re-launched Absinthe it says restore complete then does nothing. Any ideas? I’ve rebooted the ipad and the computer. I was having the same issues as everyone else so I restored iPhone and “set up as new phone” just to do the jailbreak. It worked like a charm!!! Okay so I had the problem of the “Device not ready”. After restoring my phone I jailbroke my phone with no problem. My question is how or can I restore my phone but keep the jailbreak? Same problem here, nobody want to help us? So if I restore to a new ipad, how do i get my apps back? After “Recovery Complete”, run the jailbreak again. The recovery just fixes the files from the previous failed attempt. It seems there is not yet an hactivated ipsw for 4S, I hope when it will be online , we will stil can make restore with it. Still waiting for an hactivated ipsw. Will it be possible to download custom, hactivated ipsw for 4S? We all seem to not be able to get passed the “beginning to jailbreak”, which I am assuming is because the phone is not activated. There is no way for us to activate since we don’t have the original sim and previous owners SS# and other details that activation requires. i have a question dont laugh at me at how stupid i sound but i got a ipod touch 2g i believe from wut i was told and i am have the most diffcult time jailbreakin it i get so o many different answers and i wanna know the best site to jailbreak from and software better yet step by step detailed instructions if you could i have autism and its very diffcult for me could u email me crazyk0322@yahoo.com and help me please it be greatly appreciated? restoring from iCloud backup takes longer than it is from a computer, regardless of speed of wifi. TAKE YOUR PASSWORD OFF otherwise it will not work. So I started the jailbreak, then read on here that passkey has to be turned off. Do I need to start over, because I unlocked my phone during, or do you think it will be ok? Will this jailbreak decrease battery life? I have the same exact problem, anyone help? If is not activated, the jailbreak proces will do nothing, it will start and remain frozen! For the unlock there is no software aveilable, in you case even it was, you had first to jailbreak your phone! Another solution is that sim-interposers witch nobody test them yet! I did orderd 2 and I will write an review after I will receive and test them for 2-3 days! so i have successfully jailbroken it. can i now use redsn0w to unlock the iphone 4s (5.0.1)? I can’t activate my iPhone 4s:( Can i Jailbreak it through Absinthe??? as per the instruction you gave us to use the cd command to navigate to the directory where Absinthe is located (on your computer) and then type the following./Absinthe.app/Contents/MacOS/Absinthe (now simply start the Jailbreaking process over again) but I am recently using mac .. How is it possible to do from mac ..please help me !! Does it work on iOS 5.1? When is 5.1.1 jailbreake come? does any one know what to do when it says ” the device is not supported ” ?? Please anwser!! When I plug in my iPhone 4s it says “Sorry, the attached device is not supported!! what do i do?